hexagons are really cool, i love hexagons. i've shown my love of them with a few pics throughout the years like here. and here. i have been working on a few hexagon ideas, and am still working on them throughout this summer, but here's a fun little project (and fast!) involving appliqueing hexagons onto a canvas bag. 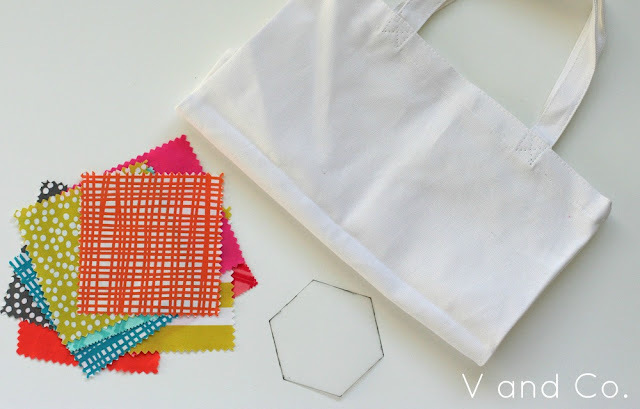 my way of appliqueing is super fast and makes it so it looks like you have totally slaved away doing needle turn when in fact you are sewing your hexagons onto pellon interfacing and creating the illusion of english paper or needle turn applique. okay after you have created your hexagon template, we are going to use our template and draw our hexagons on each of our 5" blocks. i drew mine on the right side of the fabric. next i cut out 5" x 5" blocks of the fusible webbing. 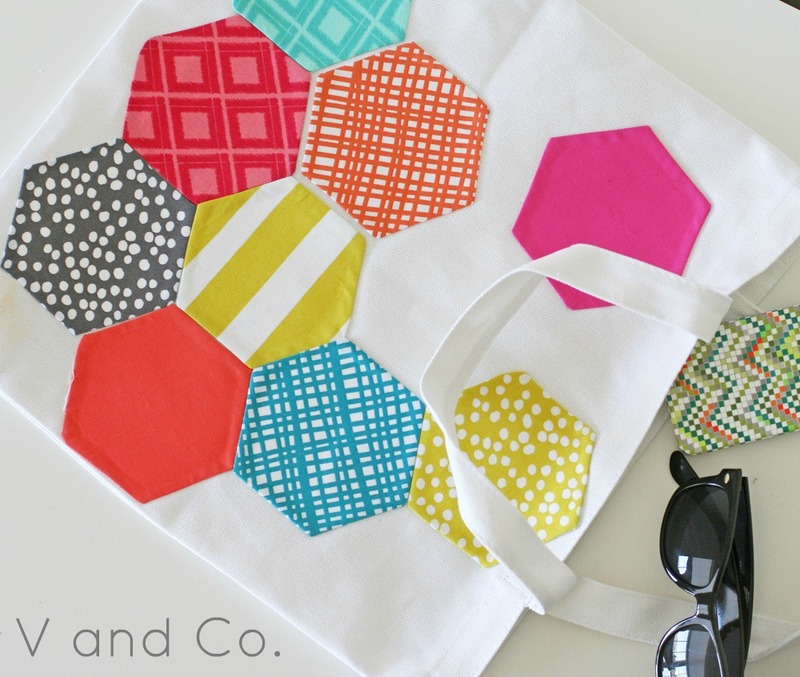 2. then i sewed on my drawn hexagon line. 3. and then i cut out my hexagons leaving around 1/8" to 1/4" seam allowance. 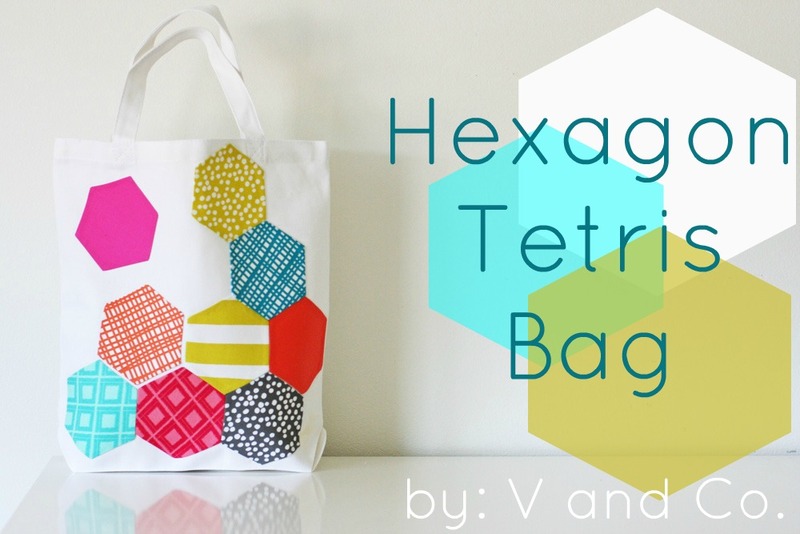 do this for all your hexagons. -next i wanted to make a slit in my webbing in the middle, so i gently pulled the webbing away from the fabric, did a slit down the middle around 1" to 1 1/2" slit. -gently pull through the fabric through your slit in the webbing. -once you have turned it inside out, gently push out the corners making sure you don't break the webbing. play around with your hexagons, make whatever design you want. really there is no limit, you don't need to worry about them all touching because you will be ironing them on and then appliqueing them...so do what you want! once i figured out where i wanted them, i ironed them down. 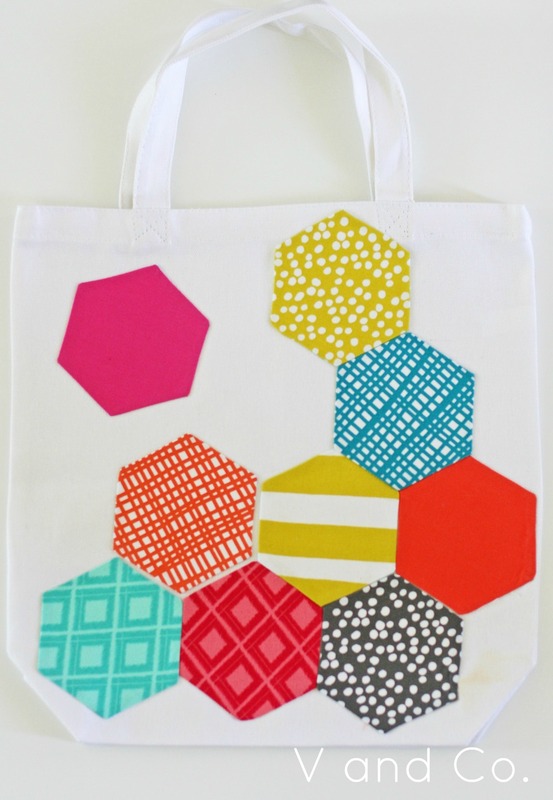 now you just have to get your matching thread and seal the deal by placing a few good applique stitches around each of the hexagons. 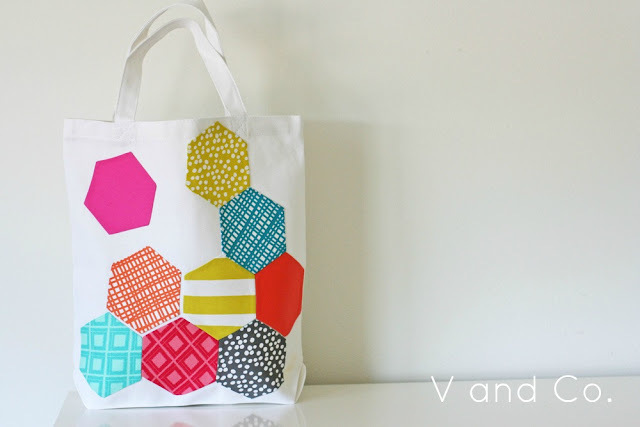 now you are pretty much ready to hit the beach, pool, park, or whatever scene with this totally cool tote. i have to say i kind of like it. like a lot. i have more fun summer ideas. just kids in the way of making them happen...and i'm really okay with that. ;) but i'll try. I love the bag and your instructions. 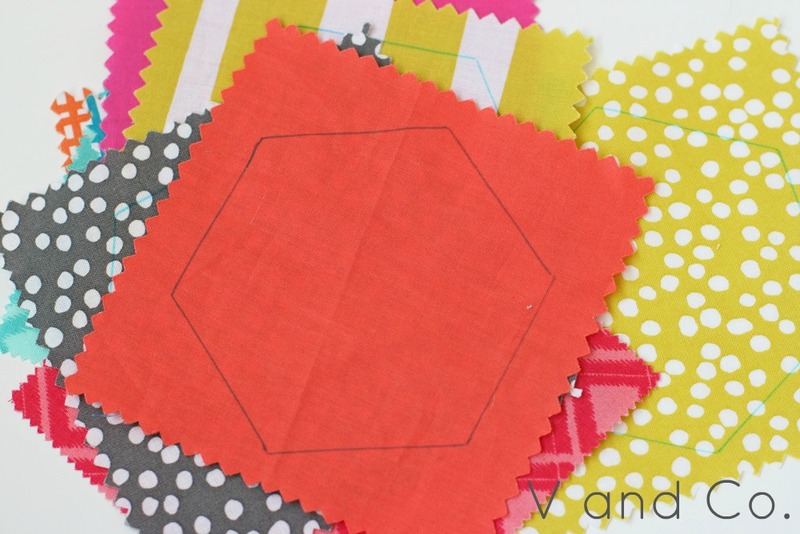 I think I need to buy a hexagon ruler. Thanks. This is super cute! 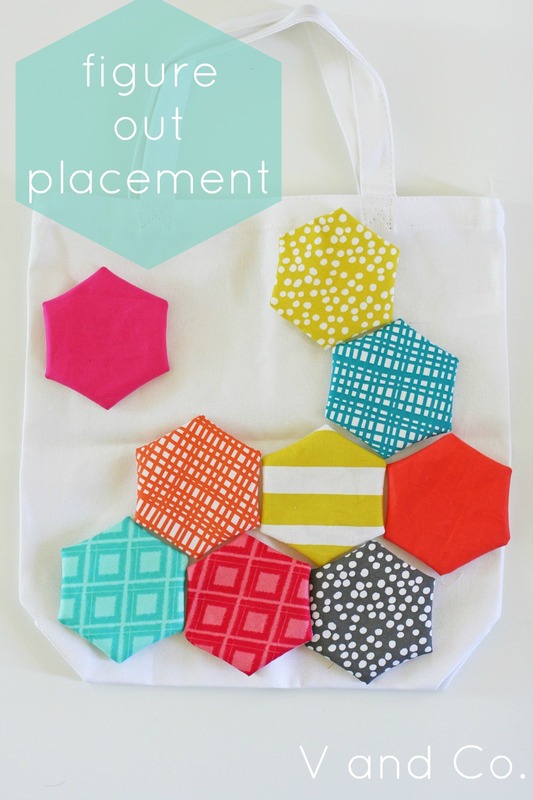 I've done the interfacing appliqué technique before but never thought of using it for hexies. This is definitely going on my summer sewing list. Cool project! My girls probably want to try this summer. Thank you for sharing! So cute....hhhuuummmm...I need a new bag for my R.S. books...oh, and my grandaughters are coming in a few days...this would be a great project for them...oh, and Auntie needs a new bag...fun...thanks!!! love it so much vanessa! looks like such a happy bag. :) and of course your technique is wonderfulllllll! 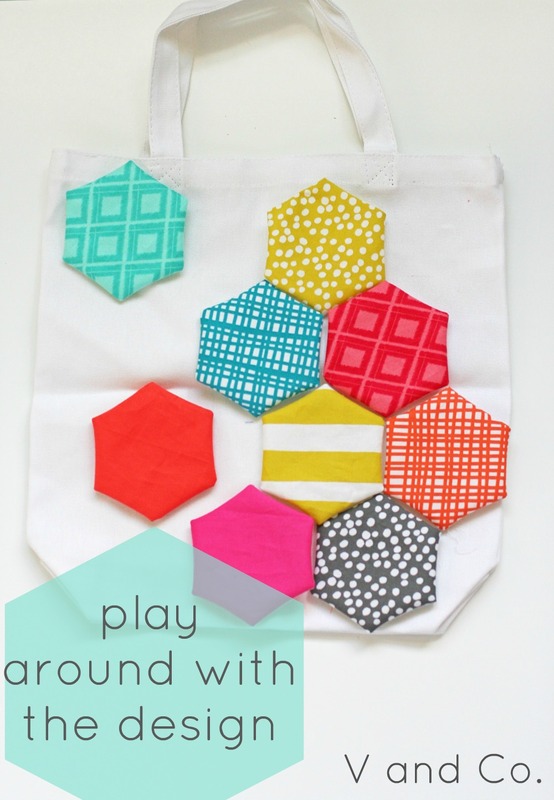 Very cute and a great method for this project. I love the fabrics and the solids really make the whole set "pop"
Brilliant! 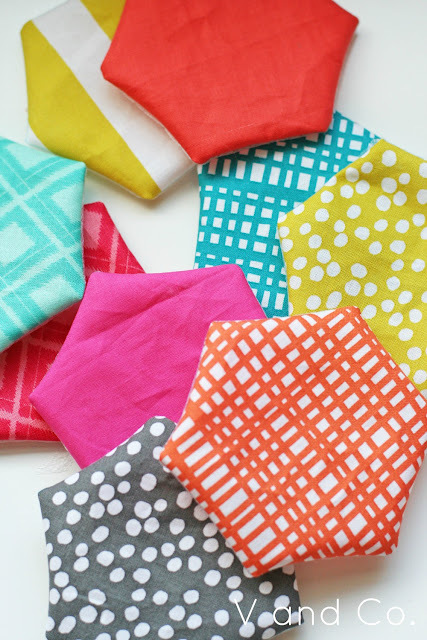 So much easier than traditional EPP! 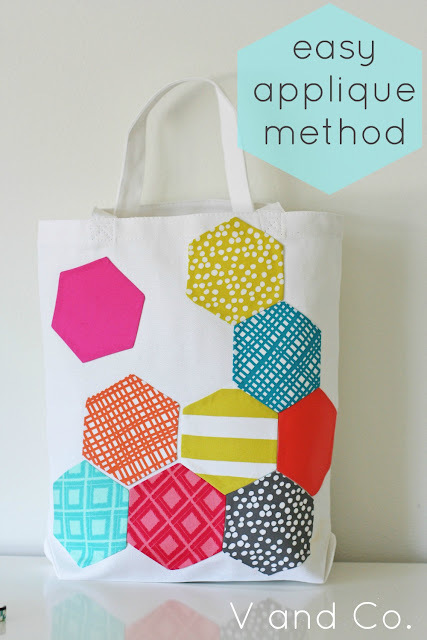 Love your applique method! Will definitely have to try this!! Shut the front door! Genius, I tell ya! What a great way to see the difference between bags. I keep my projects in them but some are the same so look forward to colouring the bags. Hopefully I can find some white bags. This post is great! 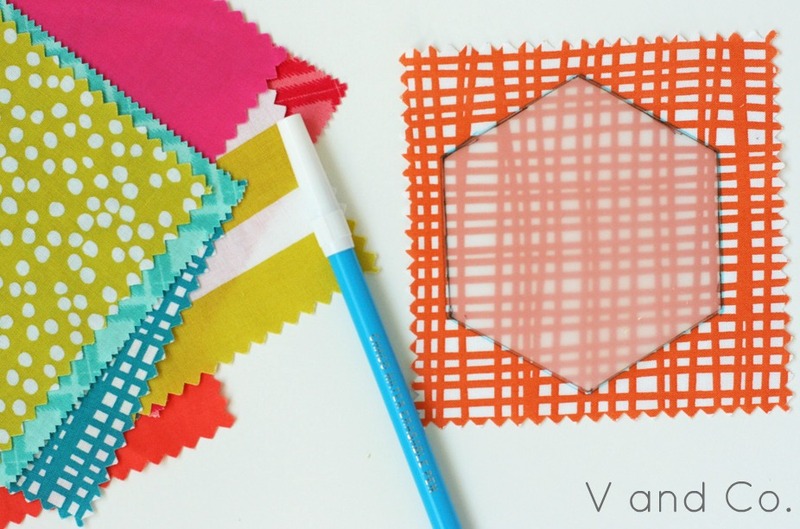 Thanks for sharing some awesome tips and a cute project. I have your book and love it. I am a high school fashion design teacher and this project would be perfect for my students as a first project to teach technique. I am new to the blogging world and I am happy to have found your blog. that's an easy but brilliant way to make a boring tote bag prettier.